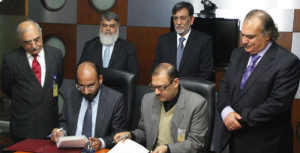 Pakistan’s premier Telecommunication services provider company, PTCL, has joined hands with Bahria Town by signing an MoU pact for the establishment of Information Communication Technology (ICT) infrastructure and services in Bahria Town, Lahore. The strategic collaboration shall empower natives of Bahria Town to enjoy and experience most advance telecommunication facilities delivered by PTCL comprising of Voice Telephony, Broadband Internet, SmartTV along with super-hit EVO Wireless Broadband internet services. PTCL President and CEO Walid Irshaid quoted on this partnership as, “This recent association between the two entities is yet another move in the direction of enhancing our valued user’s lifestyles by offering them with state-of-the-art, futuristic and diversified products and services”. Bahria Town Administrator Brigadier Ahid Muzaffar Shah also commented by saying that “We are very much glad to being in a venture with PTCL, nation’s largest and leading telecommunication services provider. This agreement shall let us move forward collectively and come up with better services to our customers and residents”.